Kinetic Theory, Volume 3: The Chapman-Enskog Solution of the Transport Equation for Moderately Dense Gases describes the Chapman-Enskog solution of the transport equation for moderately dense gases. Topics covered range from the propagation of sound in monatomic gases to the kinetic theory of simple and composite monatomic gases and generalizations of the theory to higher densities. The application of kinetic theory to the determination of intermolecular forces is also discussed. This volume is divided into two sections and begins with an introduction to the work of Hilbert, Chapman, and Enskog that led to the formulation of the Chapman-Enskog theory. The Chapman-Enskog results are then compared with those of earlier theories with respect to viscosity, heat conduction, diffusion, and thermal diffusion. 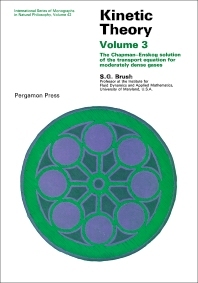 Subsequent chapters focus on alternatives to the Chapman-Enskog method and some mathematical problems; foundations of the kinetic theory of gases; and kinetic theory of processes in dilute gases and of heat conduction, viscosity, and self-diffusion in compressed gases and liquids. This book should be of interest to graduate students and others undertaking research in kinetic theory.